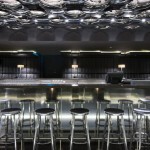 W Hotel entry & welcome area: A 6m wide fireplace with a flame over its full width. W Livingroom: A cosy, 10mx3m wooden block with carved out seating elements and fireplaces. 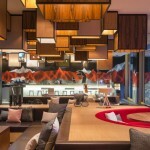 As a contrast, a carved light feature made of different types of wood is suspended above it, following its footprint. 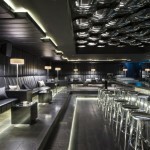 W Livingroom bar: A giant, carved ‘ice rock’ made of glass and a carved, translucent light feature above it that follows the same footprint and enhances the ‘icy’ impression. 360 degree street art panorama by tape artist Buff Diss on the living room walls. W Guest rooms: Cosy fireplaces in each of the hotel’s 123 stylish guest rooms and suites. 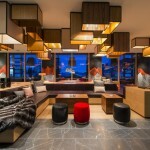 When guests enter the hotel they come face-to-face with a 6m wide fireplace. The element of fire is the ultimate contrast to the snow-covered landscape outside. The same element is further showcased in cosy fireplaces throughout the public areas and in each of the hotel’s 123 stylish guest rooms and suites. Turning right the guests face the welcome pods: two carved blocks of natural stone with glamorous inlays of brass and backlit marble. A bespoke light feature highlights the welcome pods. A few steps down from the welcome pods, passing the ‘whatever/whenever’ concierge’s desk, guests come to the lounge area. 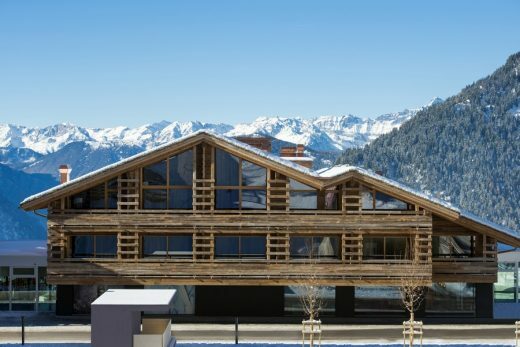 In this area the notion of Swiss chalet life is brought into the glamorous world of W. The cosy, 10mx3m wooden block with carved out seating elements and fireplaces offers a spectacular view down the valley from the W Livingroom. 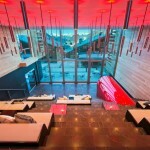 As a contrast, a carved light feature made of different types of wood is suspended above it, following its footprint. 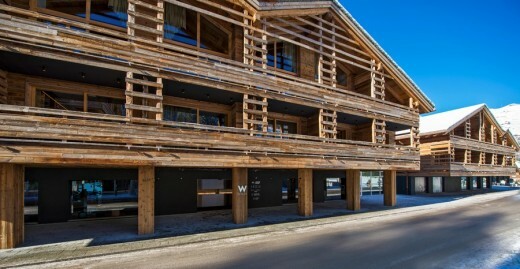 The wood is accompanied by other natural materials such as leather, felt, wool and fur which contrast with the black and silver glossy materials featured at the core of the living room and the white, glacier inspired glass bar at the opposite end of the lounge block. 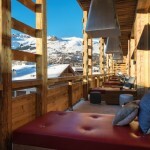 The lounge flows into a terrace where guests can chill in bulb chairs overlooking the spectacular scenery. 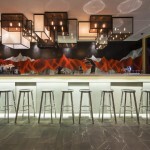 A giant, carved ‘ice rock’ made of glass forms the bar where guests come to meet, mingle and flirt. A carved, translucent light feature hangs above it, which follows the same footprint and enhances the ‘icy’ impression.The lounge bar is a good place to reside at any hour of the day. 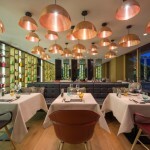 It transforms from a breakfast bar in the morning into a bar where guests can prepare for a wild night out. 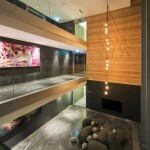 The Giant Staircase is situated next to the living room in one of the glass atriums connecting the four chalet buildings. In these atriums the landscape appears to continue inside, creating a link between the mountain slopes above and the views of the valley below. 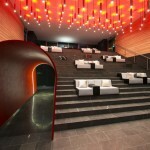 The mountain flows into a giant staircase with comfortable benches where guests can relax, hang out, meet and flirt. During the day they can enjoy the spectacular view down the valley whereas at night the staircase is illuminated in deep red light to create an intimate mood. 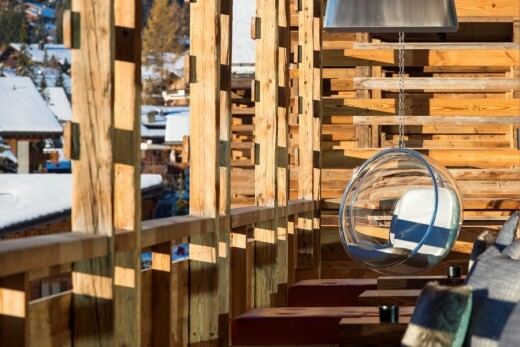 The staircase features a signal red tunnel, a contemporary reference to the Swiss railway system, that leads inside the mountain to the entrance of W Verbier’s exclusive destination bar, Carve. After an active day in the mountains or a wild night out, guests can recharge at the hotel’s Away Spa or train their muscles at Fit. The Away Spa is the perfect place to pamper body and soul and escape from it all. Carved into the mountain it features a gradual journey from light to dark, and from straight to organic forms. 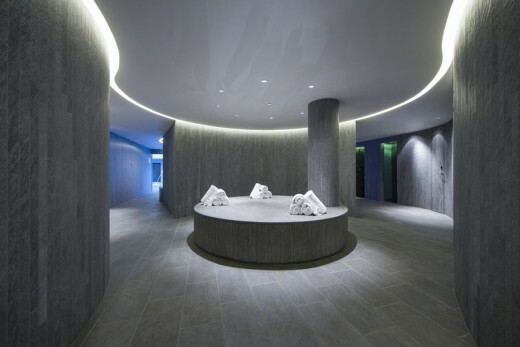 Guests enter the spa via the light, cubistic welcome area decorated with white natural stone. All reception desks and display tables are carved out from the same material. From the reception area one can also access the Fit area and yoga room. 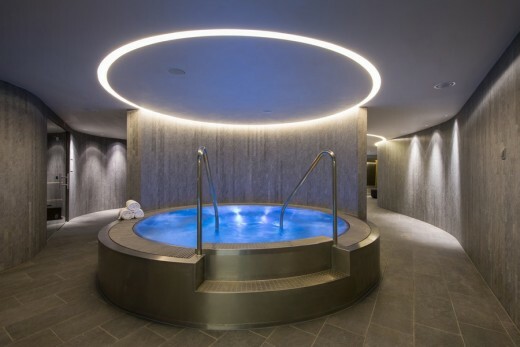 Guests who go deeper into the spa are guided via the changing rooms to the more public functions, including the hammam, whirlpool, sauna, steam bath and foot baths. All these functions appear to be carved into the natural stone of the mountain. The more secluded the functions are, the more organic the forms get and the darker the stone becomes. The journey ends in the most intimate and relaxing parts of the spa: the oval shaped treatment rooms designed in black and soft gold. From there guests slowly start the journey back from dark to light, from round shapes to the straight lines of the welcome area. 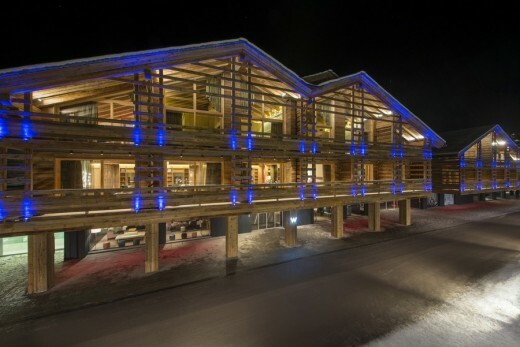 From this point guests can go for a late night swim in the organically shaped and beautifully illuminated heated swimming pool on The Wet Deck which stretches from inside to outside, allowing the guests to bathe under the stars and among the snow.